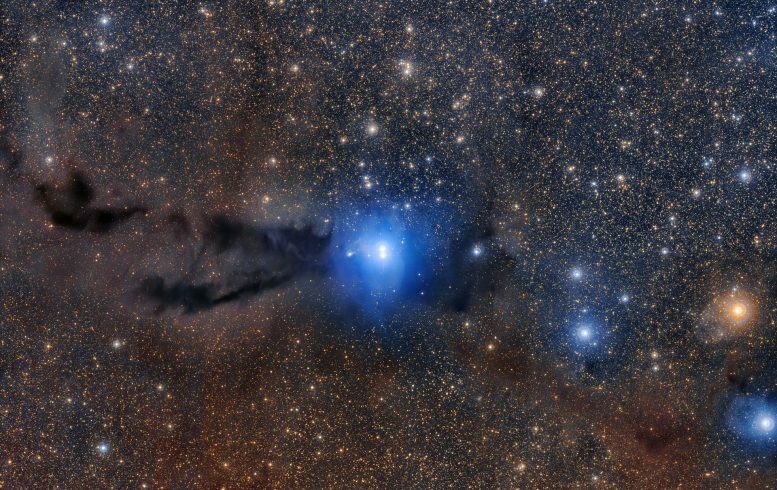 A dark cloud of cosmic dust snakes across this spectacular wide field image, illuminated by the brilliant light of new stars. This dense cloud is a star-forming region called Lupus 3, where dazzlingly hot stars are born from collapsing masses of gas and dust. This image was created from images taken using the VLT Survey Telescope and the MPG/ESO 2.2-meter telescope and is the most detailed image taken so far of this region. This short podcast showcases a new picture of this dramatic object, created from images taken using the VLT Survey Telescope and the MPG/ESO 2.2-meter telescope at ESO’s La Silla Observatory in Chile. It is the most detailed image taken so far of this region. Understanding nebulae is critical for understanding the processes of star formation — indeed, it is thought that the Sun formed in a star formation region very similar to Lupus 3 over four billion years ago. As one of the closest stellar nurseries, Lupus 3 has been the subject of many studies; in 2013, the MPG/ESO 2.2-meter telescope at ESO’s La Silla Observatory in Chile captured a smaller picture of its dark smoke-like columns and brilliant stars. Be the first to comment on "ESO Views Star-Forming Region Lupus 3, Most Detailed Image to Date (4K UHD Video)"